So apparently I haven’t been writing any updates lately. I guess that’s true and I really can’t find a way to talk myself out of that. All I can do is promise a lot of food pictures to you guys at the end of the post. I’ll just say there has been a series of events that has led to the current blog update situation. Oh and as always: Scroll down to see the food pictures! So let’s unwrap this nerve-wrenching mystery from its back-end and tell you guys about what happened in the past weeks. The short answer: Korean cold, finding an apartment, stress and losing any kind of feeling for the passing of time. First things first: People who know me and/or have been following this blog for a while should be aware that I tend to catch colds quite often. This is an especially bad habit during trips to far-away countries like Korea or Japan and given that the colds there are known to be super deadly, I can count myself happy to be well and alive right now. Actually my nose is still clogged but let’s not get into details that would ruin the food pictures. I wonder if our dear friend Communist Fish is alive an well! They look delicious, don’t they? At all my vegetarian and vegan readers: I hope you can forgive me for this. 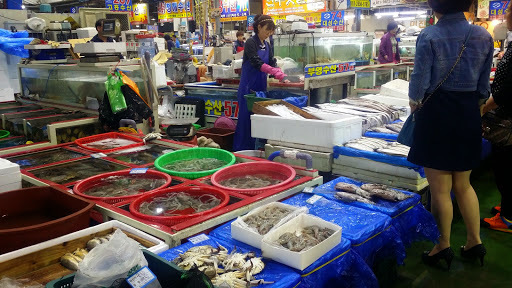 But I’d eat pretty much everything on that fishmarket. Crabs! Those were a bit expensive, but I think they always are. They’re pretty high up on my “I want to eat that in Korea” list. Maybe I’ll get to do that soon! Surprisingly, it didn’t smell at all in the whole hall. Speaks for the freshness of everything there. Felt a bit bad for those guys, but some of them had it worse. Those tanks were a bit crowded but then again, they’re not going to be there for long and their end is inevitable anyways. I should buy them and eat them to end this misery! 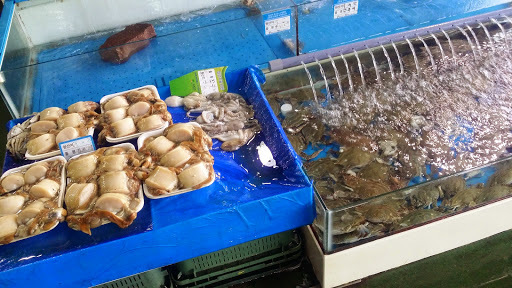 Clams and crabs. I’m not too much into clams but I’d totally try those. I mean I tried some really interesting stuff already in Korea so whatever, right? These days I’m usually busy working and learning Korean, though my Korean is still pretty awful. I said to my girlfriend: “Hah, Korean is going to be SO EASY. EZ PZ LEMON SQUEEZY.”, but I think I have to admit defeat. So, girlfriend, if you ever read this: You’re right. Korean is difficult. Even though I’d never admit that verbally. Since I didn’t do that much sightseeing yet, I can’t really show you many beautiful things apart from food. Most of my readerbase is centered around food anyway though, so I guess that won’t be that much of a problem. To the two other readers who actually care about the sightseeing stuff: Stay tuned! 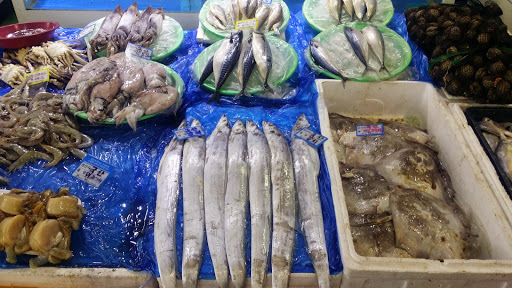 Okay so, this is about the most disgusting food there is in Korea. 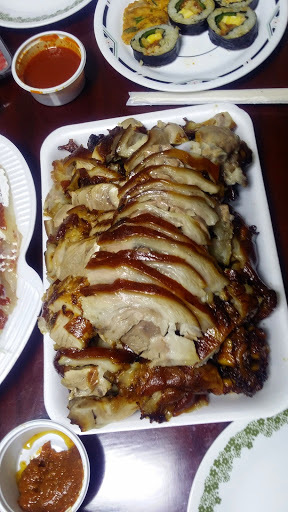 Apart from Sundae, Fishgut-Stew, boiled pig guts and dog meat. 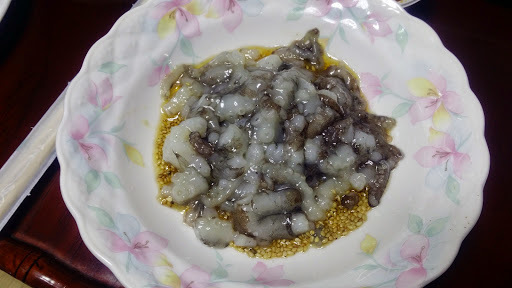 This stuff right here is called 번데기 (Beondegi) and truly not something I’d love to eat. 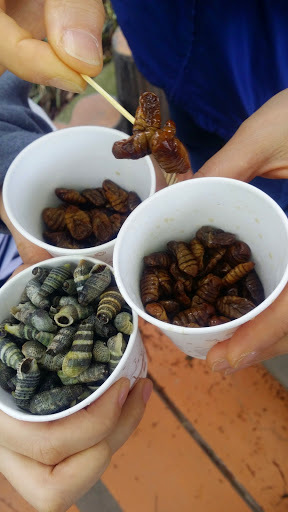 They’re basically boiled silkworm puppets and are said to not taste as bad as they sound. I have to admit, I didn’t try them yet. Mainly because I still had a full-blown cold the day we went to eat them and I forgot my water at home, so I was worried about really awful flavor in my mouth on top of being sick. I promised my girlfriend that I’ll eventually try them though so stay tuned for that! 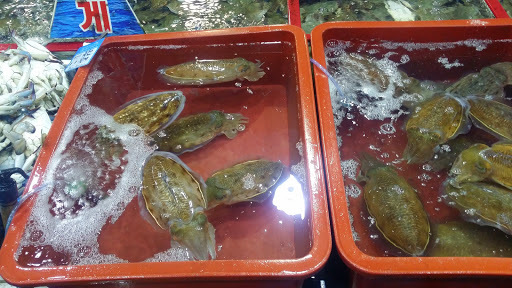 This is one of the things I was really looking forward to: Live octopus! Animal rights activists out there are now free to grab their pitchforks and start lighting their torches because admittedly, the way you eat it isn’t the most humane way imagineable. Their arms are basically chopped up while the octopus is still alive and then drenched in soy sauce. The salt (maybe the sodium?) in the sauce makes them wiggle really interestingly! 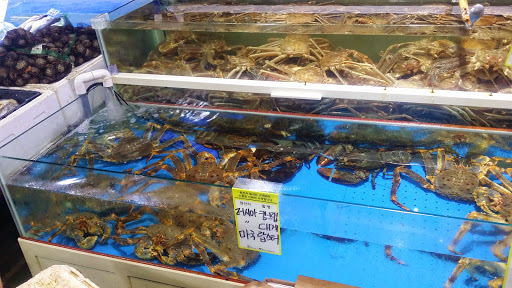 At the bottom left you can see the chopped up octopus arms. To the right of that is something called 족발 (Jokbal), which is basically something we Germans would call Eisbein. It’s delicious but a bit fatty and chewy. 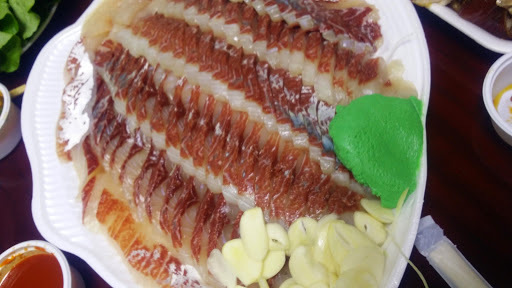 Above that is 刺身 (Sashimi) from a really delicious fish! 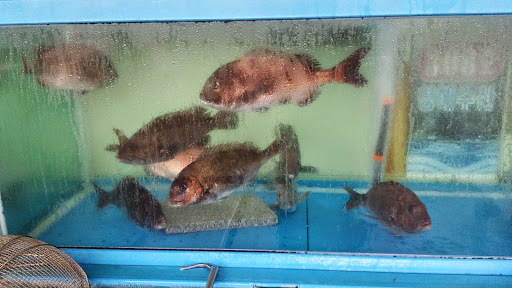 We also bought that on the fishmarket. 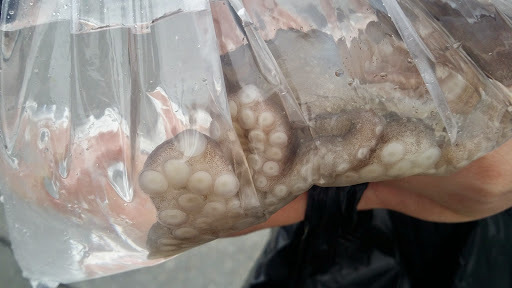 Close-up of the raw octopus. Close up of the Sashimi. Those are grilled sandwiches. We ate them after we arrived in Seoul! Our bus was super early, since we had to go to the German embassy and Minjae’s university to get some papers, that allow her to study in Germany. Anyway, Koreans seem to be really interested in foreign religions. 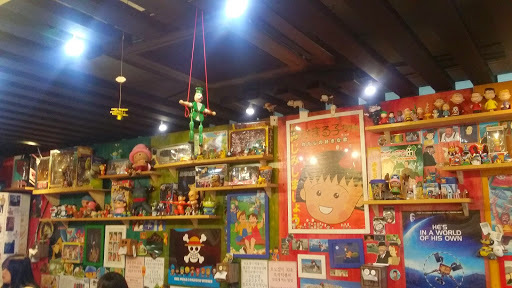 There’s a cafe called Angel-in-us, which is basically plastered with angel quotes and biblical terms. 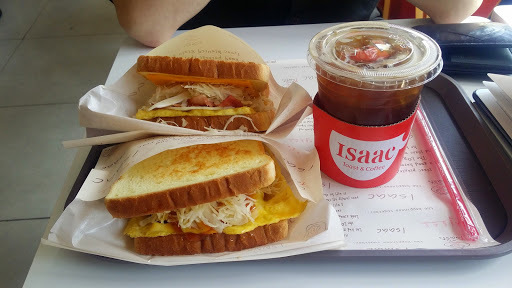 Then you have this grilled toast bar called Isaac with almost the same situation. It’s really interesting to see, since we don’t really have that in Germany at all. 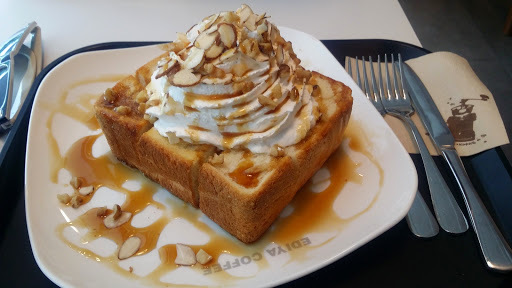 This is toast with maple syrup and whipped cream in a place called Ediya Coffee. Ediya Coffee is a poor man’s Starbucks with coffee prices starting at about 1,5 €. I love working there because they have free power supply, wifi, decent coffee and good snacks. 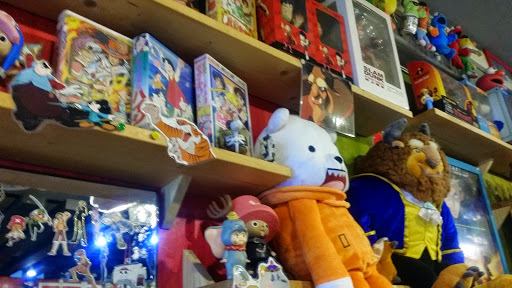 The following pictures are just some movie and videogame merchandise swag I saw while wandering through Seoul’s famous and super cute Hongdae district. There’s so many small restaurants, coffeeshops, bars and stores it basically just looks like some scene out of a movie. 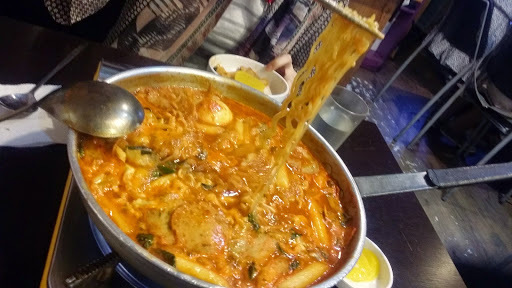 The first time we went there we got ourselves some 떡볶이 (Ddeokbokki) in a small restaurant. We knew it was going to be good because there was a one-hour line of waiting guests outside. Of course we’d never wait that long in line to eat, I mean come on we’re not crazy. Instead we did what all reasonable people would do and just went shopping until it was our turn to eat. For those of you who don’t know: Restaurant waiting lists in Korea and Japan work by writing down your name, how many people you are and sometimes crossing out what kind of food you want to eat. Eventually a waiter or waitress will come outside and call your name. This is the one-hour-waiting Ddeokbokki. It was super duper good. Really. 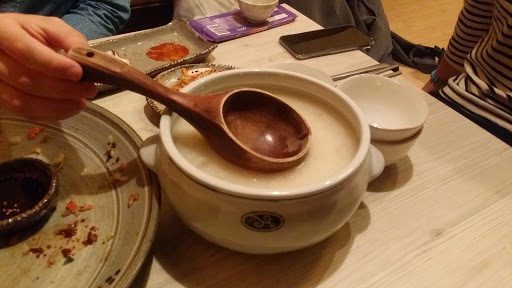 Later that day we met two of Minjae’s friends in a small pub, where we ate some snakcs and drank some 동동주(Dondongju), which is fermented ricewater with ice. It doesn’t have that much alcohol and a very unique flavor. I’m fairly certain a lot of foreign people aren’t going to like it and personally I am a bit reminded of medicine whenever I drink it. It started to grow onto me though! More Ddeokbokki, although a different kind. 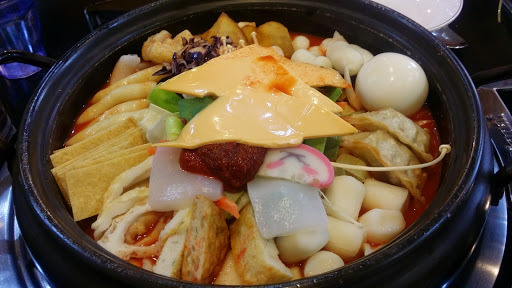 Ddeokbokki is basically different everywhere you eat it. 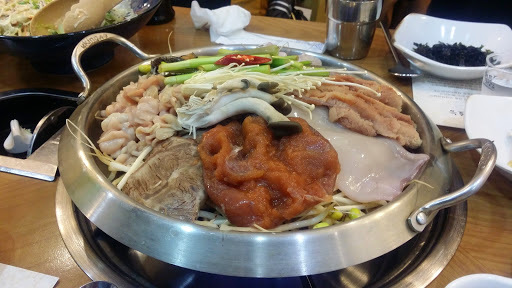 You’ll never come across the same flavor unless you go to some Ddeokbokki restaurant chain. It’s easily my favorite Korean food, followed shortly by Kimchi. This one was… a special kind of food. It’s a fish stew made mainly from lots of fish eggs, fish futts and some octopus. 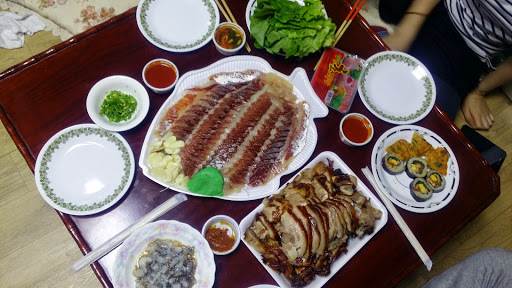 The fish guts were okay, they didn’t taste bad and had a nice texture – I’m just not a fan of fish eggs at all. I keep trying it and I keep coming to the conclusion that it’s just not my kind of food. Good for my girlfriend though, since she loves it! 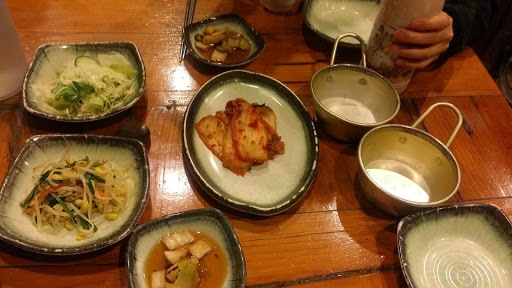 Traditional Korean side-dishes. 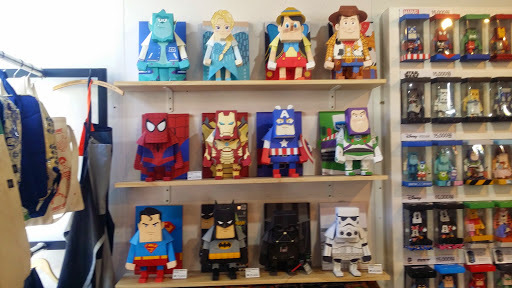 The one in the middle is Kimchi but I don’t know about the rest. You can never go wrong with Korean side-dishes though. They all taste great! 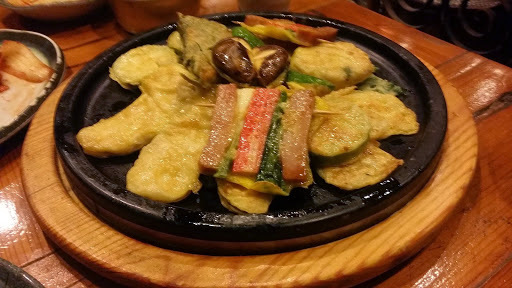 Fried mushrooms, Korean sausages and fish with eggs – or as my Girlfriend called it “Korean Pizza”. I'm both guys to look for viewpoints (sightseeing attractions) and all I can see is food, food, food. I'm vegan too, so I mostly read this blog in a way I read my legal advices of software updates. Never mind, I like your writings and I prefer it much more compared to other food stories I don't read. – I desperately hope one day I can see the North Korean border on your photos with shootings and soldiers and casualties. Or, if you don't go there, I would be thrilled to see some tigers and mammoth in the zoo of Seoul. Everything 's fine. Have a nice time and do well. Best wishes to your girlfriend too.